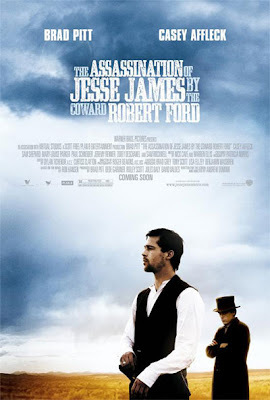 In celebration of From the Front Row's one year anniversary, and in honor of the release of The Assassination of Jesse James by the Coward Robert Ford, FTFR, in conjunction with Warner Brothers Pictures, is proud to announce the first of what will hopefully be many contests on this site. The winner will recieve a poster for the film from Warner Brothers (pictured above). All you have to do is send your name and email address to fromthefrontrow@gmail.com. It's that simple. The winner will be chosen from a random drawing and announced on October 31st, the date of the first post here at From the Front Row, and contacted via email for their shipping information. Winners' info will only be shared with Warner Brothers for the purpose of shipping their prize.